This document presents the administration of Chimère. It has been updated for version 2.0.0. Don’t forget the ending slash in the URL. First of all, you’ll have to identify yourself with the login and password provided. 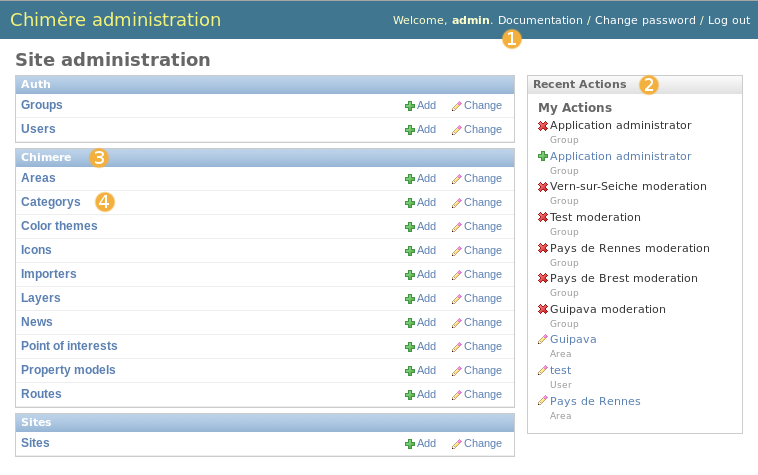 Once authentified you’ll have access to the main admin page. an item inside the application. From these pages you can Add a new item or consult/Change items. The Add link leads to the new Item form. The Change link leads to the Item list. The Item list is also available by clicking on the item label. each item can be checked (for applying an action) or selected (by clicking on the first column) to see the detail and edit or delete it. fields for the selected item (or blank if it is a new item) are displayed in this form. A few fields are read-only and another few are hidden. Mandatory fields have their label in bold. Changes on these fields are only effective once the form is submitted. for some items there are associated sub-items. These associated items can be modified in this form. If there are many sub-items associated for the current item, they can be ordered by drag and drop. the form has to be validated by one of these action buttons. They are self-explanatory. Status is a property attached to each geographic item in Chimère. To administrate efficiently Chimère you need to understand the mean of each status. Submitted: Status of a new item freshly proposed by an end user. This item is not visible on the map. 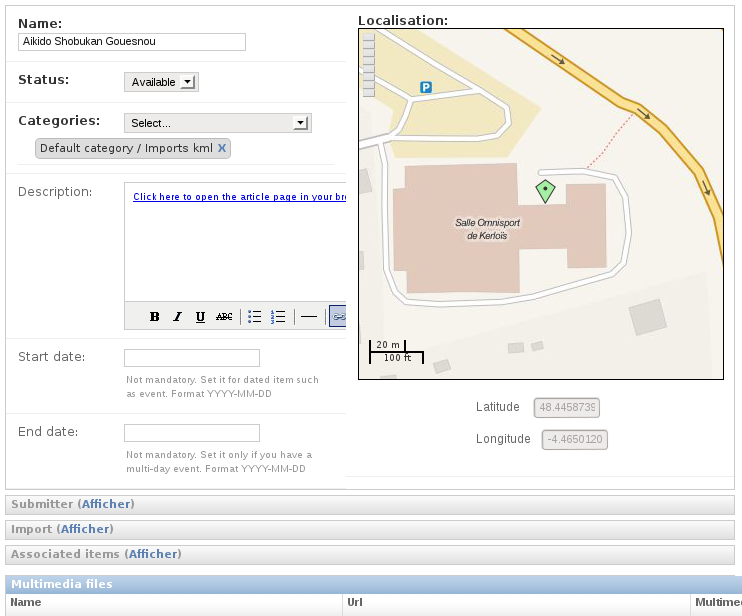 Available: Status of an item visible on the map. Disabled: Status of a discarded item. Modified: Status of an amendment proposed by an end-user. Imported: Status of a newly imported item. 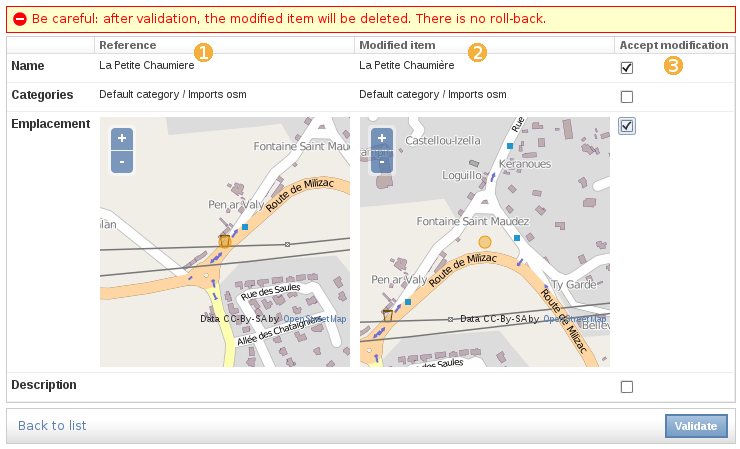 Import and export operations need that all items with imported status are treated (validated, disabled or deleted). A news system is available. All you have to to do is to click on the Add button near News. For each news you have to provide a name and a content. The content can contain HTML tags. The availability is set with a checkbox. Before adding categories you have to set some icons. These icons appear on the map and in the categories’ box on the main map. Be careful to resize correctly your icons. Indeed the icon will be presented at their real size on the map. To add icons: the Add button near Icons. The website http://mapicons.nicolasmollet.com/ allow to easily generate map icons. Categories are in fact only containers for subcategories. You’ll have to provide only a name and an order. To add categories: the Add button near categories (quite clear now, isn’t it?). Fields of subcategories are: an associated category, a name, an icon, an order, a color and an element type. These fields are mainly quite self- explanatory. The color is used to draw routes (if this subcategory contains routes). If it a basic color it can be set with the English name (for instance: red, blue, yellow or purple) otherwise you can put the HTML RVB code (for instance #9227c9). The element type is the type of element that the subcategory can contain: POI, route or both. The moderation step is quite simple. It works the same with POIs and routes. The moderator can access to all POIs (or routes) by clicking on them on the list. A search field is available to search by name but the more interesting is to filter POIs (or route) by state and by subcategory. Export to...: to export selected item to the selected format. To modify an item, classically you have to click on its name. 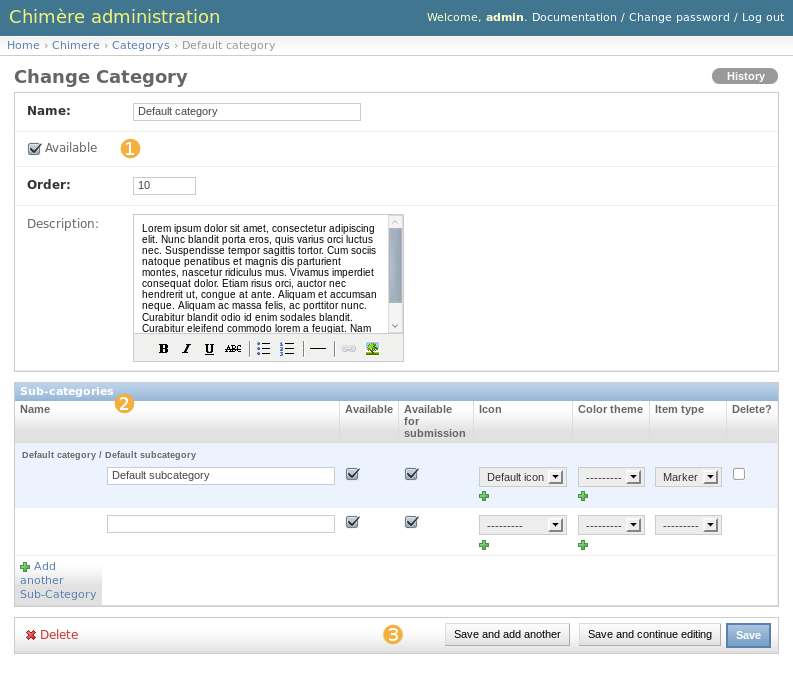 Then you access to a form to freely modify the item. In this form there are all data available to the end user form plus some extra fields. Associated items fields are read-only fields that list items associated to the current one (for example the reference item of an amendment or an associated file of a route). Associated multimedia items are at the bottom of the form. You can freely add, change items and change their order with drag and drop. Don’t forget to validate your change with one of the Save buttons at the bottom of the form (it is easily forgotten when you change multimedia items). If an item is not relevant the Delete button enables to remove it. Amendment can be proposed on the main site by end-users. In Chimère an amendment is a new item with the status Modified and with a link to the reference item modified. You can also have imported items which have been modified both locally and on the external source. 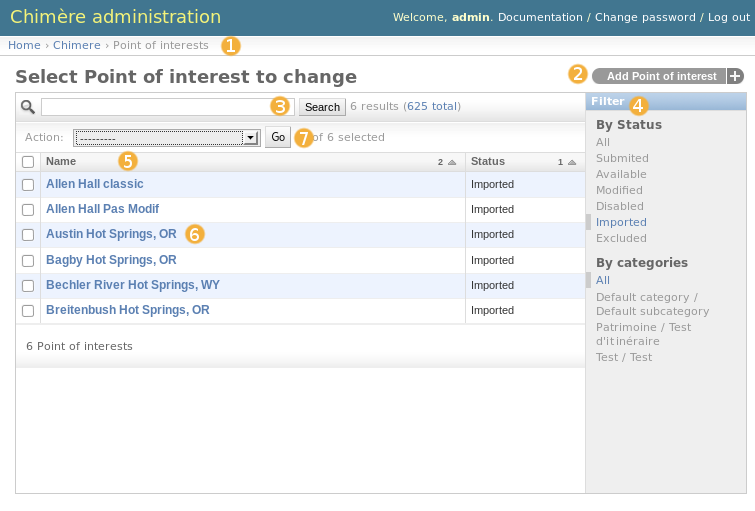 The new version from the external source has the status Imported and have a link to the reference item. 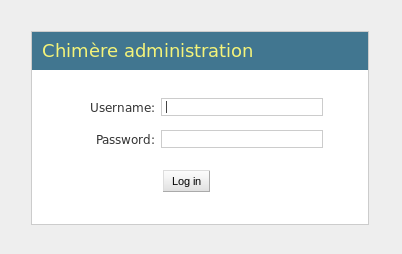 If you are logged as an administrator and make changes on the map with the end user form they will be directly validated. A special form has been developed to facilitate the processing of these modified items. You can access to this special form with the action Managed modified items. The third column is a list of checkboxes. For each row checked, after the validation, the value of the modified item will replace the value of the reference item. To reject all modifications validate the form with no checkbox checked.